All smiles in Lausanne—but glummer faces offstage in Riyadh. Flickr / European External Action Service. Some rights reserved. Could we be witnessing a slow-burning but inexorable chain reaction of nuclear proliferation in the Middle East? While the Israeli leadership predictably condemned last week’s nuclear deal with Iran, Gulf state monarchies are grappling with uncertainty about the future and assessing their options. The Saudis have already hinted that they could develop their own nuclear-weapons capabilities, pointing to a highly dangerous scenario where states in an unstable region deploy nuclear arms or remain ready to do so at short notice. We could be standing at a critical moment. 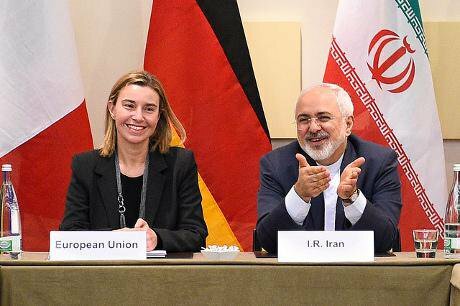 The joint statement by the EU and Iran in Lausanne last week contained much promise of significant agreement, though much remains to be agreed before the deadline of 30 June. The White House issued its own ‘Parameters for a Joint Plan of Action’ a few minutes later, outlining its detailed understanding as to what had been agreed, which seemed to some a little too good to be true. Iran has apparently accepted that any agreement would tightly constrain its fuel-cycle activities and related research, with inspections more intrusive than any other country accepts, in return for limited recognition of rights it already enjoys and sanctions relief yet to be defined. Of course, the Iranians are probably relying upon the adage expressed within the agreement that nothing is agreed until everything is, and will be expecting a good deal more than is currently on the table or hinted at in this ‘fact sheet’. It could be that they are buying time and have yet to press their strongest demands. It could also be that the Iranian leadership has recognised that its nuclear capabilities are a highly symbolic sideshow to the bigger game of regional influence and regime survival, and that this deal and further negotiations could lead to some regional power shifts and realignment. It may not ever become the alliance with the United States that some have rather ridiculously suggested (that would hardly be welcome in Tehran), but the fact that relations have thawed sufficiently for the two states to be fighting (separately) on the same side in Iraq against Islamic State (IS) says something. And that something is not welcomed by the Gulf Arab states. Attending a conference this week in Abu Dhabi involving high-level military and civilian officials, mainly from the Emirates and Saudi Arabia, I was left in little doubt that there are serious concerns in some Gulf Co-operation Council (GCC) states about the consequences of the Iran deal—even if the alternative (a less tightly controlled Iranian nuclear programme) was hardly palatable—and that these states could in the longer term consider nuclear options which could have damaging regional and global consequences. They have until now largely delegated their strategic security to the US and other allies, with the stakes of the latter in oil and markets deliberately reinforced by defence imports and the hosting of major military bases. This co-operation has never been wholly comfortable for either party. Support for Israel by the US has been far more deeply rooted in the latter’s political culture and its liberalism goes down badly within the Gulf, while human-rights abrogations, inequalities and lack of democracy in the region undermine any political support in the west. Yet it has been a lasting relationship, strengthened by the common threat arising from the 1979 Islamic revolution in Iran and a rising radical Islamism which threatens western involvement in the Middle East and the legitimacy of the Arabian monarchies. Many within GCC states now see their protectors apparently flirting with the common enemy, Iran (and, to a lesser extent, the Muslim Brotherhood). Their fear is not primarily that the Iranians will use any nuclear weapon, were they eventually to develop one. Rather, they fear that this competitor, already highly active within Arab states, will be emboldened and step up its regional activities, directly opposed to their vital interests. They also believe that the US might become a little less robust with the Iranians if they stick to the letter of any deal. Incidentally, despite the rhetoric from the Israeli leadership around the use of nuclear weapons, its fear is different although closely related. If Iran were to acquire nuclear weapons Israel might lose control and dominance in the region. This all points to a critical but under-reported division which cuts across the region: not the sectarian, Sunni-Shia cleavage, though this is certainly important; not the Arab-Israeli-Persian tension, though this runs deep and has been raging for centuries; nor whatever side states choose in their relationship to the west, though this influences revolutions and social movements; rather, it is the battle between states supporting the status quo and those who seek to challenge it. From this perspective Israel and the GCC states are acting to resist change. IS is attempting to use an even more radical conservative ideology to return to a bygone era, while Iran is using a mix of Shia Islam and European revolutionary thinking to overthrow monarchism and challenge western dominance. Those states seeking change can find unity in challenging injustice, even if their ideologies or identities are very different. Iran finds some support in the Arab world reaching way beyond Shia communities, which strongly concerns those states investing heavily in stability. It stands accused of meddling in Syria, Iraq, Lebanon and Yemen, of supplying weapons in some conflict zones, of having direct military presence in others. But the deeper threat lies in the promise of change, involving ideas like justice, equality, even democracy and the rule of law. Of course, the reality within Iran does not come anywhere near these ideals, but when the pain of injustice lies so deep across the Middle East those who offer change are highly attractive. The status quo states are willing to go to war in Yemen, believing this could stem the tide of change and maintain stability, but this strategy involves a never-ending war on the symptoms. Better would be to steer the change sweeping through their region by giving people more investment in the structures they seek to protect. This involves more than giving hand-outs to citizens or tying powerful western governments and corporations into sharing their interests—though these can certainly be effective. It means tackling corruption with greater rigour, strengthening the protection of human rights and bringing more democracy to the region. There is not a simple trade-off between this approach and pursuit of ‘national security’, as so often portrayed. The two are co-dependent. Stability does not mean keeping things as they are, but rather ensuring that transitions are managed and negotiated. If Arab states were to go down this route, they would also find western governments would enjoy greater and more sustainable domestic support in providing the sort of security guarantees the former will seek at the forthcoming summit with the US president, Barack Obama, at Camp David, and when they meet at foreign-minister level with NATO states in early May. This mirrors the stakes in the global nuclear-weapons arena. Those states in possession of nuclear weapons jealously hang on to their supposed advantage, fearful that, were they to give up their arsenals or the weapons were to spread, they would lose much of their influence. So they fight their non-proliferation battles, willing to go to war at times to do so. They use the international organisations at their disposal to maintain the status quo but it is a losing battle, because the ground is inexorably moving under their feet: if there’s one thing certain in this world it is change itself. With a Security Council frozen to reflect power in 1945, the United Nations risks becoming increasingly irrelevant. And because the world powers have held on to their symbols of ‘security’ and ‘stability’, particularly nuclear weapons, those very symbols become highly attractive to those seeking to challenge the status quo. Our main collective hope lies in a loss of their perceived potency before it’s too late. Governments, particularly those that base their defence policies on possessing nuclear weapons, or on allies that do, have the leading responsibility to ensure this happens. Despite its reputation for being contrary when it comes to nuclear diplomacy, the Arab League has been a positive influence in leading this process. It has taken an assertive, principled, law-based approach to challenging the status quo in meetings linked to the Non-Proliferation Treaty. This has come across to many as obstructing the smooth flowing of the NPT review process, yet in many respects, though its methods may be a little suspect, the league has been more faithful to the treaty than many. There were calls this week at the conference, widely supported in the room, for GCC states to demand nuclear protection from the west (buying into the indefinite attachment to nuclear ‘deterrence’) and develop their own dual-capable technologies—as options to leave the NPT and to acquire their own arsenals, as ultimate protection from the Iranians and the Israelis. These calls came strongest from Emiratis, though their government has gone further than any other to offer assurance to the world that its nuclear programme is entirely civil in character, and has been rewarded with leading-edge nuclear technologies. They are highly dangerous suggestions but it does not take much empathy to understand the underlying emotions. Having played the non-proliferation game straight, and heard promises of disarmament from the nuclear-armed states for almost half a century, their advocates note that Israel cannot be inveigled to attend the conference the Arab states were promised would happen before the end of 2012—putting at risk the whole NPT process. They know that Israel has experienced very little explicit pressure to join the process. Its allies have stressed the need to give Israel strong assurances before it can be expected to attend such a conference. Yet its leaders advocate illegal military action against Iran, on the basis that the latter might have a nuclear-weapons programme decades less sophisticated than Israel’s own, while being a party to the very treaty with which Israel refuses to engage. Because the Arab states have decided not to continue informal consultations in Switzerland, fearing that again they were being played with and that the pressure would be off at this year’s review conference, because that process was ongoing, they now risk blame for putting it at risk. The narrative within Arab states today reflects deep resentment. It’s not pleasant to be taken for a ride, to be made to look stupid. There is no worse sin in the macho world of international relations (particularly when an Arab) than to be perceived as naïve and weak and disrespected. While this is unlikely to lead to a rapid proliferation of nuclear weapons, a slow but inexorable destruction of the international non-proliferation regime does loom. The Saudis are making hints about following Iran down the path towards a weapons capability but they will be cautious: there’s too much at stake in terms of other relationships. It is in their interests that the US and Iran are aware of the risks of pushing them down that route. And we will see a massive expansion in their civil nuclear programme, one that could herald extensive dual-capable systems. Whilst the United Arab Emirates has entered into agreements involving extensive transparency and the foreswearing of these technologies (choosing to rely upon imports for all its fuel), Saudi Arabia pursues a policy of opacity, maintaining a bare minimum of co-operation with the International Atomic Energy Agency. It joined the NPT in 1988 but only signed a safeguards agreement with the IAEA in 2009. It has only accepted an old version of the Small Quantities Protocol, which enables the state to declare widespread exceptions to IAEA inspections on the basis that there are only insignificant activities in the country. All eyes will be on the Arab League, to see what diplomatic trouble its member states might stir up at the NPT review conference when states first meet on 27 April. But it is outside the conference hall where the real signs of trouble will be found, and in particular in the changing nature of strategic considerations in Arab states. All states involved, directly or indirectly, need to consider their parts in this dysfunctional and dangerous game.